Welcome to the Phonetics Lab! Welcome to the Sophia University Phonetics Laboratory. We are engaged in a wide range of research themes related to acoustics and the production and perception of speech sounds. It is one of the facilities of the Sophia Linguistic Institute for International Communication (SOLIFIC). We do research in acoustics and the production and perception of speech sounds. More specifically, we are engaged in such fields as theoretical phonology, acoustic phonetics, L1 and L2 phonological acquisition, and communication disorders. Also, we often collaborate with Sophia University Research Center for Communication Disorders and Arai Laboratory in the Department of Information and Communication Sciences. The lab is located in the Building 9, Room 9-555A, Sophia University Yotsuya Campus, Tokyo (map). It consists of three areas. The main room or the research room is used as the office for professors and lab secretaries. It is also used by other lab members such as visiting researchers and graduate students. The equipment includes computers, scanners and printers. It also serves as an archive for our selected collection of books related to phonetics and phonology. The room is also used as classrooms for some graduate courses. The studio is a sound-attenuated room equipped with recording devices. 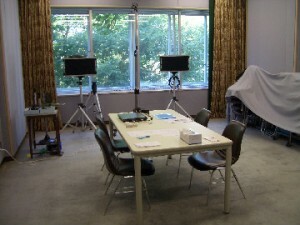 Production and perception experiments are conducted here. The lab also possesses an anechoic chamber, which is mainly used for acoustic experiments. The Sophia University Phonetics Laboratory was established in 1950 by Professor Tsutomu Chiba, the first author of “The Vowel, Its Nature and Structure (1941)”. After Professor Chiba, it was directed by Professor Kazuo Nakano, and then by Professor Tsutomu Sugawara. The present director is Professor Shigeko Shinohara.